You’re welcome to take a look anytime at my anchor set up, message me when you’re going to be around. Jimmy Green Marine offer calibrated chain and joining links, I just ended up buying 50m in one length for peace of mind. I’m sure the link would be ok, but as I was upgrading to a Rocna I chose not to cut corners. Message me when your next on the Hamble, I won’t be down for a few weeks now as going away next week, and busy this. We have the 415, for taking it offshore we have upgraded to the Excel (not sure of weight but must be around 20kg). We also have 70m of 8mm chain and another 50m of rope. The boat came with 30m chain and I used a stainless joiner which is perfect and goes through the gypsy like a regular link. Upgrading the anchor from a Delta would be a good idea. Matt - you can join chain but you'll reduce its strength. 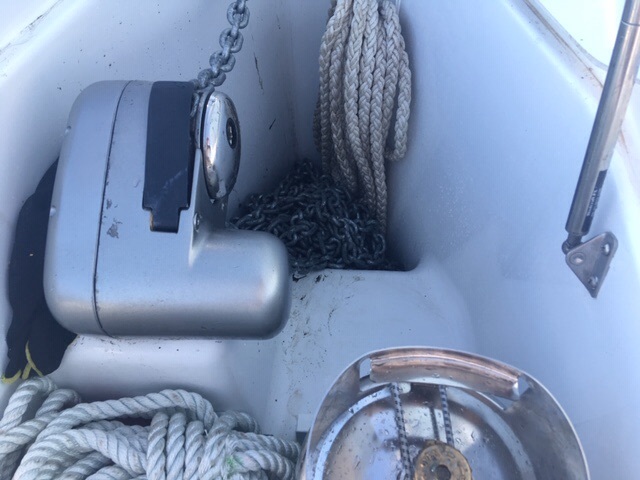 I changed from a 15kg Delta to a 20kg Rocna keeping the original 28m chain/30m cable for use with the Delta as a backup anchor. The bower now has 50m chain with 30m cable. I also have 12m polyester as a snubber which I regard as essential kit. Suggest G40 galvanised long enough to give you 7:1 scope in the depths you're likeliest to drop anchor in if you're heading to more remote areas. Beyond 7:1 the law of diminishing returns becomes compelling. The photo attached is the 418 locker with 50m of 8mm chain. You could fit a bit more in, but not much.